Combining cuteness and low-maintenance care in one convenient package, this attractive set of 4 mini artificial succulents is an ideal way to add lively decor to small spaces and empty nooks around the home or workplace. The square and bright white ceramic planters contrast well with the lush green of the imitation succulents, and complement a variety of office and home decors. Use as a set as individual pieces to provide some hassle-free plant beauty to any work or leisure area in need of a decorative pick-me-up. Approximate Dimensions (in inches): Tallest succulent plant & pot - 4.3 H x 1.97 W x 1.97 D. Ceramic pot - 1.77 H x1.97 W x 1.97 L (top); 1.77 W x 1.77 L (bottom). 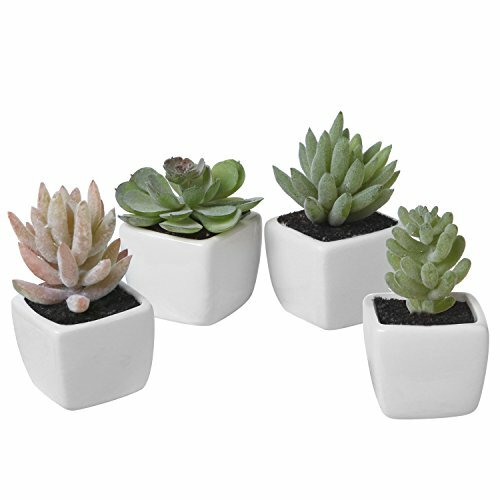 A realistic set of mini artificial green succulent plants in square white ceramic pots. Compact size allows plants to be used to decorate small spaces, such as desks, bookshelves or windowsills. Provides the beauty of natural greenery without any of the hassle or upkeep. Square white ceramic pots complement a variety of home and office decors.